For our last travel leg, we took a noon flight from Kayseri to Istanbul (booked ahead of time), after having gone hot air ballooning that morning. We arrived and took a taxi to check in to our “splurge night” at the Four Seasons at Bosphorus. I’m pretty thrifty, so even with a good deal and a room upgrade it was a little painful signing over the pre-authorization paperwork, but our experience more than made up for the dollars spent. 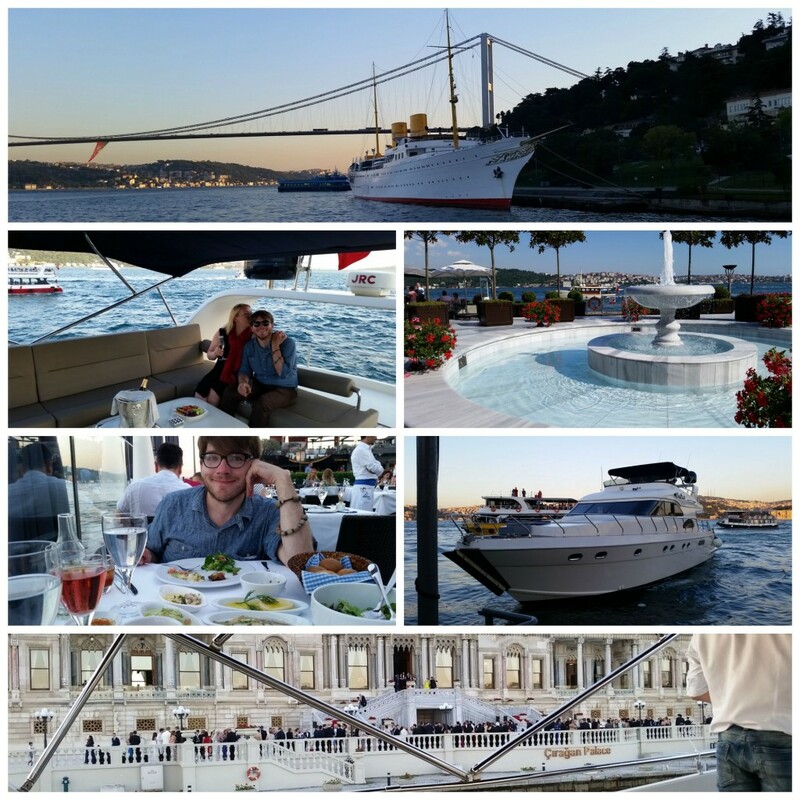 For Josh’s birthday dinner, we booked a “water taxi” with the concierge to a restaurant on the Bosphorus, and they upgraded us to a yacht! We returned to champagne & chocolate that night, and a luxurious breakfast buffet the next day. Do not do any of this, especially the hot air balloons, unless you want to set a ridiculously high birthday bar for your spouse that you can never possibly live up to again. For the rest of our time in Istanbul, we used Chase Sapphire points to stay at the Vault Karakoy Hotel in Beyoğlu. This was a great hotel and location right by the Galata Bridge. I should know, since I spent a bunch of time in it (my first day and a half I was knocked out with what felt like the flu). 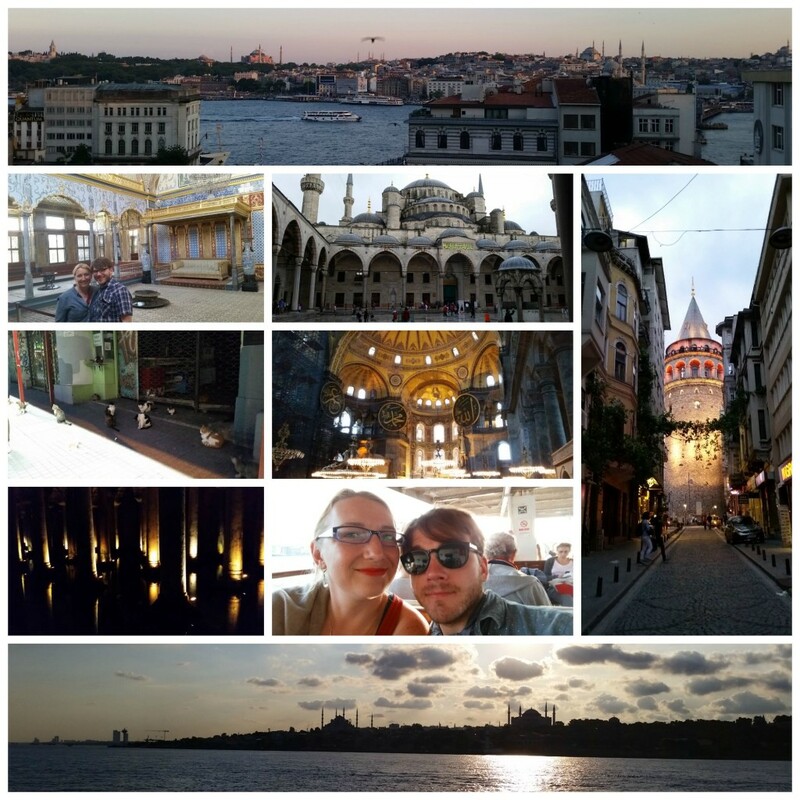 On the last day, I was feeling the urge to make up for lost time, so we hit up Hagia Sophia, the Blue Mosque, Basilica Cistern, the Grand Market, and took a boat over to Kadakoy on the Asian side. So yes you can do all those things in one day! Wear a long dress and bring something with sleeves and a scarf for the Mosque. Best meal: the chicken soup that Josh and the hotel concierge hunted down for me when I was feeling sick. Besides that, we had a great meal at Ciya in Kadikoy, on the Asian side of Istanbul, though we experienced a bit of a language barrier. “What am I looking at?”: Throughout our trip, most museums and tourist attractions had signage in English (in varying degrees of usefulness). At Topkapi Palace, we hired a personal tour guide for an hour. He was delightful, but pricey. At Hagia Sofia we rented audio tours, and that seemed to be a good way to get more information on the cheap while moving at our own pace. CHEATING: I don’t like haggling and I was afraid if waited to buy souvenirs from the Grand Market on the last day, we might come home with nothing. So the evening before, we picked up towels and some other souvenirs from the shopping district in Beyoğlu. Then, when we went to the market we were able to just wander and look without feeling obligated to buy anything (we got talked into buying scarves anyway, as will you probably). Oops: we missed out on hammam! A good reason to go back.